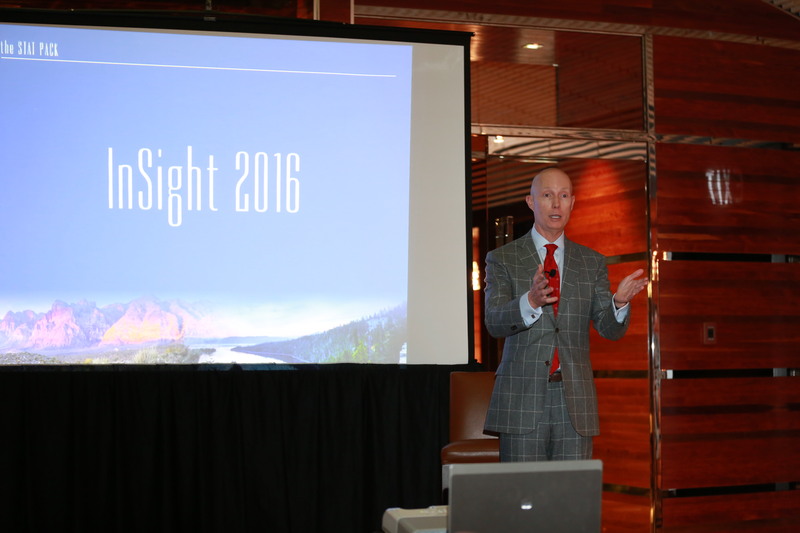 HENDERSON, Nev. – The Henderson Chamber of Commerce hosted InSight2016, an analysis and prediction of the economy from an international, national and local perspective, Wednesday evening at the LUX at the M Resort. This was the event’s second year. Mike PeQueen of HighTower Las Vegas and John Restrepo of RCG Economics, who co-publish the Stat Pack, presented their analysis to a packed room of invited guests, the chamber’s 96 sponsors and board members. The Stat Pack tracks key metrics and trends relevant to decision-makers, offers analysis and commentary on financial and economic issues and events, and highlights the latest data-driven findings from the best sources. PeQueen and Restrepo combine stats, charts and graphs with succinct analysis and curated at-a-glance content. Together, the presenters covered everything from how the world’s major players are performing, to a detailed analysis of the local economy. He also said Southern Nevada is seeing a steady job growth of about 2 percent a year — 2.1 from 2014 to 2015 and, again, from 2015 to 2016, to be exact — which Restrepo said is healthy, as anything above 3 percent is not sustainable. Meanwhile, he said, Las Vegas MSA population and growth is hovering just above 1.5 percent, with 1.6 percent growth from 2014 to 2015 (2,060,207 to 2,094,046) and 1.7 percent growth from 2015 to 2016 (2,094,046 to 2,129,491). “We like to see job growth outpace population growth,” PeQueen said later in the evening. Restrepo also said the Las Vegas MSA Gross Metropolitan Product growth is at 3.1 percent (from 2015 to 2016), which is also healthy. “It’s going to be a decent 2016,” he said. 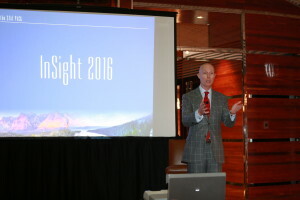 During PeQueen’s presentation, which took an international approach, he mentioned that Las Vegas is rare in the fact that — as a tourist destination — it benefits from decreased oil prices. With the Chinese economy at the top of mind for many business professionals, PeQueen noted that only 13.5 percent of the U.S. GDP are exports to the rest of the world, with 7 percent of U.S. exports going to China. Only 1 percent of the U.S. GDP consists of exports to China. Continued steady and moderate growth in the economy through 2016. We’re seeing a strengthening job market. Finally an increase in “real wages” (wages after inflation) and average hours worked per week. U.S. economic growth is more certain because we have strong employment, stable housing prices, and still-low interest rates. 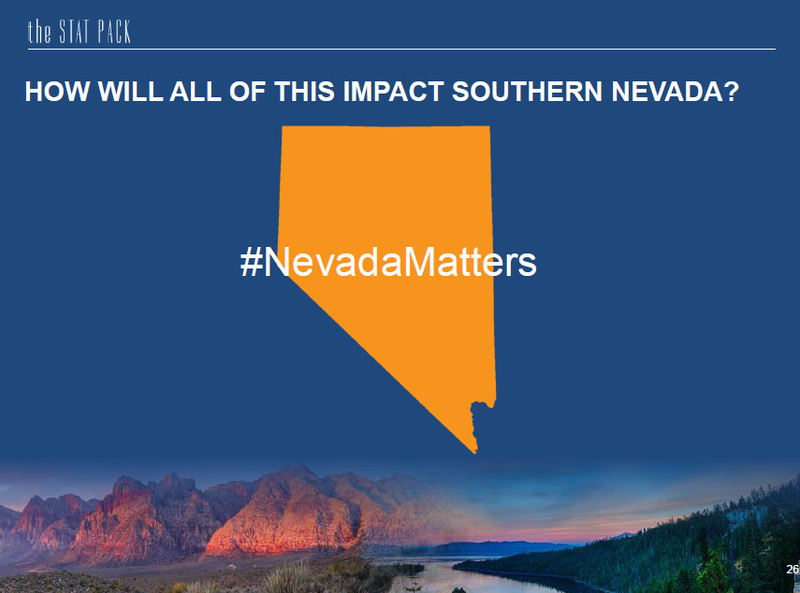 Southern Nevada’s economic growth will probably be higher than the U.S. average. Global growth in 2016 is uncertain because of China. We’re generally optimistic. By the second half of the year, the stock market will probably recover. The Henderson Chamber of Commerce is a nonprofit, professional organization committed to promoting and supporting member businesses. For more information, call the Henderson Chamber of Commerce at 702-565-8951 or visit hendersonchamber.com.